Oskar sliding suction rail has been designed to allow transport of fume extraction equipment (fume arms or hose drops) between air pollution sources. SSR suction rail is used with manual and automatic welding, machining as well as automotive exhausts in car repair facilites. Thanks to sliding suction rail one or two fume extraction sets can moved between number of air pollution emissions. Sliding suction rail main construction element is standard 4 meter long segment made of aluminium profiles, reinforcements and exhaust trolley (standard inlet dia. 160 mm) travelling between self-sealing rubber flap. Suction rail segments can be connected together to form long movable extraction systems. Trolley ready to use with Oskar fume extraction arm or hose drop (set of elastic hose, nozzle and balancer). 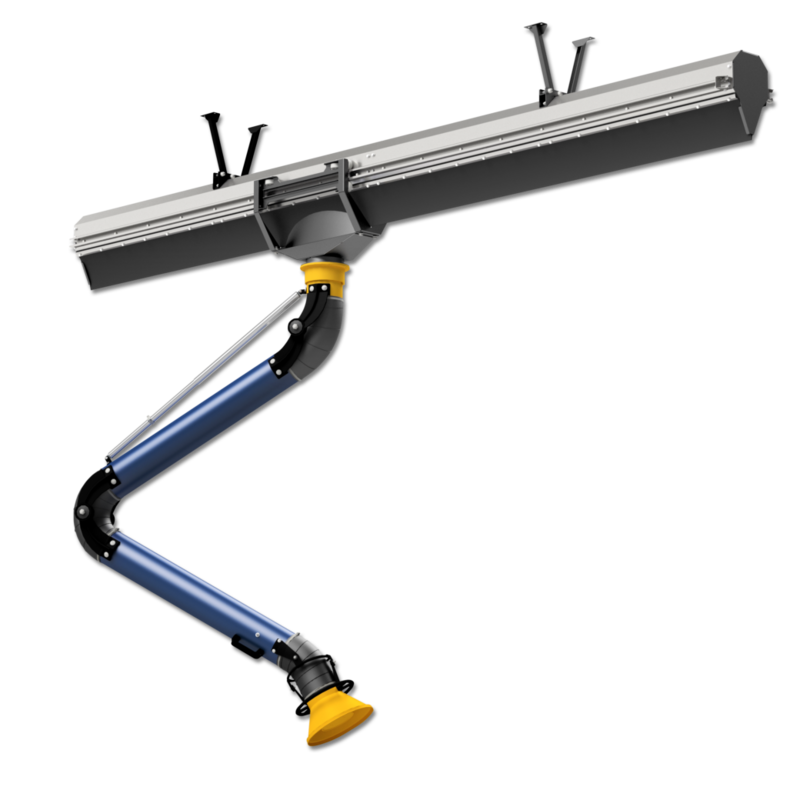 Oskar self-supporting fume arm – the sliding suction rail is normally made to direct mounting 6″/160 mm fume arms, to mount arms with other diameters an additional flange is required. Flexible hoses for extraction of vehicle combustion gases (different diameters and lengths) – in this case one flange connector is needed and also a gear clamp. The other end of hose is equipped with a nozzle. To hang it to the rail use a balancer.